There are two theories as to the "humane" way of cooking lobsters — plunging them into boiling water, so that they die almost instantly, or gradually heating the water so that the lobster scarcely feels that it is getting hot. So far as is known, no one has ever elicited a preference from a lobster. So too the citizenry in general are seldom consulted as to how they want their cultural revolutions — gradually over time, so they can digest change bit by bit, or all at once. For thirty years, Americans have been repeatedly tossed into an already boiling pot, to which they must adjust as best they can. On matters pertaining to the Sexual Revolution, American society fulfills the old jibe, slightly modified, that it has gone from Puritanism to decadence without passing through any intermediate stages. As late as the 1950's (probably even later) liberals were among those using allegations of homosexuality to discredit people they did not like, such as Roy Cohn, an aide to Senator Joseph McCarthy. In the perhaps excessively heterosexual Kennedy White House it would have seemed bizarre to suggest that "gay rights" ought to be the next logical extension of liberalism, and as late as 1972 Senator George McGovern complained that he was unfairly accused of favoring "acid, amnesty, and abortion" (he did favor the latter two) but was not accused of favoring homosexuality. On some college campuses the liberal fascism dubbed "political correctness" has descended to the level of crude brainwashing on the borderlines of physical coercion, as in a Williams College student's description of how students reluctant to attend "sensitivity" sessions were routed out of their rooms by the college staff and herded into meetings where they were subjected to deliberately insulting and threatening "educational" procedures. The use of coercion in these matters follows inevitably from the self-censorship which liberals practice. Having consciously refused to make familiar kinds of logical distinctions (is "discrimination" against homosexuals really like discrimination on the basis of race? ), they have no choice but to use coercion against those who have failed to acclimate themselves to the boiling pot. To discuss these issues rationally is already, in the minds of many liberals, to act immorally. The homosexual "lifestyle." As with all revolutions, this one has both a moderate and a radical face. When it suits them, some homosexuals talk about aging male couples who have lived together for thirty years in almost boring domesticity. But no one believes such cases are at all typical, and in other situations the movement deliberately assaults every traditional moral sensibility, flaunting its feverish promiscuity. If homosexual "marriages" are in theory deemed legitimate, why do they seem so foreign to the general homosexual experience? In the history of the Church there have probably been many homosexuals who led lives of heroic chastity, for whom temptation was precisely the means by which they achieved sanctity. In today's Church there are no doubt individuals, including priests, who are doing the same thing. Their "orientation" ought to be no one's business but that of their religions superiors, and they may well have a higher place in the Kingdom than those who have never had to struggle against such an obstacle. Hitchock, James. "Coming to a Boil." Catholic Dossier 3 no. 3 (September-October 1995): 37-39. Reprinted with permission of Catholic Dossier. James Hitchcock, historian, author, and lecturer, writes frequently on current events in the Church and in the world. 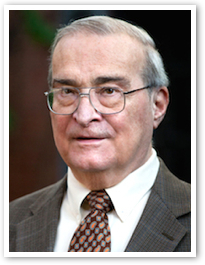 Dr. Hitchcock, a St. Louis native, is professor emeritus of history at St. Louis University (1966-2013). His latest book is History of the Catholic Church: From the Apostolic Age to the Third Millennium (2012, Ignatius). Other books include The Supreme Court and Religion in American Life volume one and two, published by Princeton University Press, and Recovery of the Sacred (1974, 1995), his classic work on liturgy available here. James Hitchcock is on the Advisory Board of the Catholic Education Resource Center.